Iran says accusations by Saudi Arabia and the US that it supplied the missile fired by Yemen's Houthi rebels at Riyadh on Tuesday are "baseless". A foreign ministry spokesman said Iran had "no arms links with Yemen" and that the country was "in a blockade and such possibility does not exist anyway". 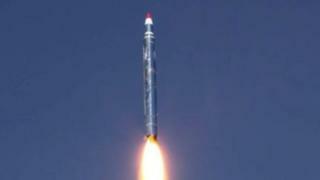 The Saudi military said it intercepted the missile south of Riyadh. There were no reports of any damage or casualties. The Houthis said they targeted a palace where the Saudi leadership was meeting. They have been fighting a war against forces loyal to Yemen's President Abdrabbuh Mansour Hadi and a Saudi-led coalition backing him since March 2015. The coalition receives logistical and intelligence support from the US and UK. The Houthis' Missile Forces announced they fired a Burkan H2 missile at the al-Yamama Palace in Riyadh on Tuesday afternoon "in response to the heinous crimes committed by the US-Saudi aggression against the people of Yemen". The coalition said the missile was "indiscriminately launched towards Riyadh to target the civilian and populated areas". The attack proved the "continued involvement of the Iranian regime in supporting the Houthi armed group with qualitative capabilities in clear and blatant defiance" of two UN Security Council resolutions, it added. Later, the US permanent representative to the UN said the missile "bears all the hallmarks of previous attacks using Iranian-provided weapons". "We must all act co-operatively to expose the crimes of the Tehran regime and do whatever is needed to make sure they get the message. If we do not, then Iran will bring the world deeper into a broadening regional conflict," Nikki Haley told the UN Security Council. Iranian foreign ministry spokesman Bahram Qasemi said the country was "brave enough to announce such actions and policies" in Yemen if there were any. "Weapons used by the Yemenis today are leftovers in the bases of previous governments. We can see today that to defend itself from violations and constant attacks, Yemen is starting domestic production of equipment and it is natural," he told Iran's al-Alam TV on Tuesday night. On Wednesday morning, Foreign Minister Mohammad Javad Zarif called Ms Haley's accusations "provocative, purposeful and dangerous" and said he would be following them up at UN meetings and with the secretary general. "They try to hide their support for the bombardment of the innocent Yemenis through such accusations," he told the official Irna news agency. The coalition meanwhile said it would keep open the main rebel-controlled port in Yemen for another 30 days to allow deliveries of humanitarian and relief supplies to continue, as well as with commercial shipments of fuel and food. The coalition tightened its blockade after a missile fired by the Houthis came close to hitting Riyadh's international airport. But it eased the restrictions after the UN warned that they could trigger "the largest famine the world has seen for many decades". More than 8,670 people have been killed and 49,960 injured since the coalition intervened in Yemen's war, according to the UN. The fighting and the coalition blockade have also left 20.7 million people in need of humanitarian aid, created the world's largest food security emergency, and led to a cholera outbreak that is thought to have killed 2,219 people since April.